Traditional antivirus software does not integrate well with virtualized infrastructure. McAfee MOVE AntiVirus brings optimized, advanced malware protection to your virtualized desktops and servers, including your virtual environment in the cloud. Choose one efficient solution across multiple vendor platforms or an agentless, tuned option for VMware vShield. Either way, you get both flexible, top-rated security and high performance. For proactive protection, we integrate real-time threat intelligence and unify security management across physical and virtual infrastructure. Optimizing security for virtualized environments — By optimizing and offloading McAfee VirusScan Enterprise’s processing features, MOVE AntiVirus enables you to obtain higher operational returns, and minimizes the performance impact on virtual servers with enhanced scan avoidance and scanning based on overall load of the hypervisor. Standardizing security across all major hypervisors — Whether you are starting to deploy virtual machines or well on your way with cloud computing, MOVE AntiVirus offers the flexibility of consistent security across all major hypervisors. Ensuring the best security management and delivery for virtualized environments — Utilize and optimize your current McAfee VirusScan Enterprise protection in virtualized environments including your virtual machines in the cloud, providing security management and effectiveness with the McAfee ePolicy Orchestrator (McAfee ePO) console. Ensure that security policies remain intact, even as virtual machines migrate within the virtualized environment. Traditional antivirus does not play well with virtualized infrastructure. McAfee® Management for Optimized Virtual Environments AntiVirus (McAfee MOVE AntiVirus) brings optimized, advanced malware protection to your virtualized desktops and servers. Implement across multiple vendor platforms, or choose an agentless, tuned option for VMware vShield. Either way, you get flexible, top-rated security and high performance. McAfee MOVE AntiVirus supplies anti-malware protection optimized for the resource constraints of virtualized deployments. McAfee MOVE AntiVirus frees hypervisor resources while ensuring up-to-date security scans are run according to policy. Instant protection with low impact on memory and processing. Options include on-access and scheduled scans. Multiplatform (vendor neutral) or agentless on VMware. Real-time file analysis through McAfee Global Threat Intelligence. At-a-glance visibility, control, and reporting across your endpoints. Get instant protection with low impact on memory and processing. Benefit from options that include on-access, scheduled, and selective scans. Gain support for all major hypervisors. Optimize your time with a dedicated, hardened virtual appliance. Leverage real-time file analysis through McAfee Global Threat Intelligence. Achieve desktop firewall, memory, and web application protection (included). Realize at-a-glance visibility, control, and reporting across your endpoints, including your virtual machines in the cloud. The dynamic nature of guest desktops and virtual servers requires careful handling. Images must be malware-free while offline or scanned without delay when users initiate a session. Anti-malware isn’t the only service starting up, and users often begin work in groups, causing peak-demand “antivirus storms” that consume all resources and prevent users from obtaining a session. To eliminate scanning bottlenecks and delays, McAfee MOVE AntiVirus offloads scanning, configuration, and .DAT update operations from individual guest images to a hardened virtual appliance/offload scan server. We build and maintain a global cache of scanned files to ensure that once a file is scanned and confirmed to be clean, subsequent virtual machines (VMs) accessing that file won’t have to wait for a scan. Memory resource allocation for each VM decreases and can be released back to the resource pool for more effective utilization. Intelligent scheduling of on-demand scans ensures that scans don’t interfere with hypervisor performance. In data centers, maintaining visibility over the entire virtualized environment can be a struggle for security administrators. McAfee Data Center Connector provides a complete view into virtual data centers and populates key properties like servers, hypervisors, virtual machines, even the cloud, into the McAfee® ePolicy Orchestrator® (McAfee ePO™) console. Clients can register a vSphere or Amazon Web Services (AWS) account with McAfee ePO software to discover and gain visibility into all VMs, whether or not they have deployed McAfee protections. With complete visibility, the task of securing the data center becomes simplified. Administrators can monitor hypervisor-to-VM relationships, security status, and power status in near real-time. A customizable, at-a-glance dashboard displays security scan status, executive overviews, historical security data on assets, and administrative actions. The familiar McAfee ePO software console lets you configure policies and controls for McAfee MOVE AntiVirus behavior. Data from virtual desktops can be rolled up with data from other systems within unified dashboards and reports. Administrators are able to configure a unique policy per VM, resource pool, cluster, or data center through the McAfee Data Center Connector, adapting their security needs specifically to the makeup of the data center. Deploys and configures SVA on multiple hypervisors. Supports SVA deployment in VM cluster environments. Support ESXi 4.1 Patch 3. In agentless deployments, VMware vShield Endpoint uses the hypervisor as a high-speed connection to allow the McAfee MOVE AntiVirus security virtual appliance (SVA) to scan virtual machines from outside the guest image. As it scans, the SVA will direct vShield to cache good files and either delete, deny access to, or quarantine malicious files. After you install and configure the SVA and the required vShield components on the ESX servers, along with installing the vShield driver on the guest VMs, every image is automatically protected at creation. There’s no requirement to install McAfee software on each client VM. Our vMotion-aware implementation means your virtual machines can move from one host to another and be seamlessly protected by the SVA on the target host, with no impact on scans or the user experience. McAfee integration allows you to monitor SVA status within vCenter and receive alerts if the SVA loses connectivity. McAfee ePO software receives event data detailing the specific VM affected in the event a VM is infected. In multiplatform installations, the McAfee MOVE AntiVirus agent—a lightweight endpoint component—communicates to the offload scan server to broker the antivirus processing on behalf of each virtual desktop. A McAfee ePO software agent manages policies and scanning functions. You can designate and scan a gold image for use as a clean master. Pre-populating global caches with clean images delivers the fastest VM boot-up time. When a user accesses a file, the McAfee MOVE AntiVirus offload scan server performs an on-access scan, providing a response back to the VM. Users can be notified of issues through a pop-up alert, and files can be moved to quarantine to await a decision. Each virtual machine can be configured with unique, individual policies set in the McAfee ePO software console, or the VMs can be managed as a group. 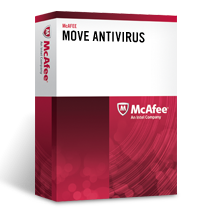 Download the McAfee MOVE AntiVirus Datasheet (PDF).